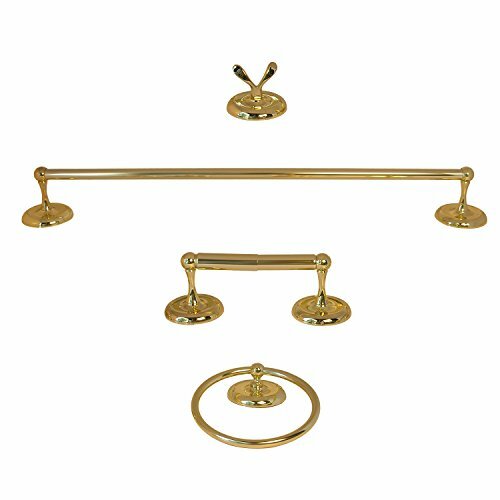 LASCO-Simpatico 35-5349 Luna Series 4-Piece Bathroom Accessory Set, All Metal Construction, Polished Brass Finish. The Simpatico collection is dedicated to designing and delivering stylish bathroom accessories made for functionality and durability. This 4-piece Luna Series bathroom accessory set is made of solid metal and comes in a polished brass finish, adding a lovely accent to any bathroom. All hardware is included and the mounting screws are concealed for a clean 'screw less' look after installation. Larsen Supply is a third generation family owned and operated company with over 80 years of experience has the largest retail plumbing line in the industry today with over 7000 packaged and 16,000 bulk SKU's. We pride ourselves on service, selection and support! All Lasco merchandise is warranted to be free of manufacturing defects. Please revert to retail place of purchase for resolution of any possible plumbing questions, warranty or defective part replacement.